You are here: Home » MEDIA » Books » The Creativity Of Ditko by Craig Yoe (book review). 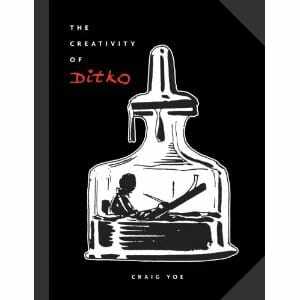 The Creativity Of Ditko by Craig Yoe (book review). This large book is a celebration of ‘The Creativity Of Steve Ditko’, the famous comicbook artist who co-created Spider-Man and created Doctor Strange, when he was at Marvel Comics in the early 1960s. That material is not featured in this book, except for a page or two of the webbed one. Most of the work here, as far as I can tell, is drawn from Ditko’s work at Charlton Comics. The contents page gives the story titles but you have to go to the bottom left hand corner of the first page of the story to find where and when it was first published. To save uncounted hordes leafing through the book at stores across the land, I have given those details below. First up is ‘From All Our Darkrooms’ published in Out Of This World # 5 (1957). It’s a clever SF story about invaders from another dimension with a cunning method of getting to our world. No writers are credited for most of the stories herein, which is a shame. I guess the book is not about their creativity. It is probable that many of the scripts were by Joe Gill, who did much of the writing for Charlton Comics. Next, ‘Director Of The Board’ is from Strange Suspense Stories # 3 (1957). Determination, ruthlessness and something else got Mister Laing to the top of the industry but he should be careful with whom he shares the secret of his success. It’s hard to get much effect from stories this short but some manage. In ‘The Mirage’, from Out Of This World # 7 (1958), a con escapes from a prison on the edge of a desert. He’s determined to cross it, though no one ever has. A lot of these are fairly trite tales of the type done by O’Henry but even so, it does take a lot of imagination to turn them out month after month. Credit where it’s due. There are only three pages to ‘Menace Of The Invisibles’ from This Magazine Is Haunted # 13 (1957), about invisible invaders from another dimension. Ditko does an excellent picture of a spooky looking house. The story is introduced by some chap in a green cape and a big green hat. He also narrates ‘One Way Trip’ from Mysteries Of Unexplored Worlds # 10 (1958). Here a man is diagnosed with a condition that is usually fatal. Dare he dream of a future? ‘We Sell Time’ is from Mysteries Of Unexplored Worlds # 21 (1960). A mysterious clock salesperson can transport you into the past or the future, but there’s a price to pay. Again, a reasonably strong narrative is squeezed into a mere five pages and Ditko‘s art is very apt. The next eleven pages, ‘Prologue’ and ‘The Ultimate Evil’ are from The Many Ghosts of Doctor Graves # 12 (1969). Graves, in his spirit form, fights an evil spectre menacing Earth. The good doctor closely resembles another sorcerer with a medical title invented by Ditko in his prime. (Even Stan Lee gives him the credit for that one.) I guess he is entitled to copy himself. After a brief interruption for ‘The Treasure Of The Swamp’ from Ghostly Tales # 80 (1970), which isn’t great, a chap very similar to Doctor Graves narrates ‘An Ancient Wrong‘ from Out Of This World # 11 (1959). Yet this bloke precedes Dr. Graves by a decade. The answer to the puzzle is that Ditko and many other comic artists, use certain facial types. One could not do portraiture to early comic deadlines, so they used recognisable motifs like beards, moustaches, spectacles and hair to distinguish one character from another. Some are bound to repeat. For a change of pace, the middle of the book has some titillating pictures (the adjective is carefully chosen) that Ditko did with his studio colleague Eric Stanton for Diabolique Magazine # 3 in the early 1960s. One girl is covered in a spider-web sort of costume! Well…not exactly covered. Traditional comicbook fare resumes with ‘Hide And Eeeeek’ from Ghostly Tales # 85 (1971). Mister Spyte throws a party and the guests start to disappear. Ho hum! It’s better than ‘Dig This Crazy Pad, Dad’ from Ghostly Tales # 88 (1971) which has a painfully ‘hip’ script and some proof that Ditko can’t draw youths with untidy facial hair. One bloke looks like a werewolf. There is a lot more. ‘The Mystery Of The Wax Museum’ from The Many Ghosts Of Doctor Graves #29 (1971). ‘Return Visit’ from Ghostly Haunts #23 (1972). ‘To Tlakluk’ from Ghost Manor # 4 (1972) seems to be somewhat experimental artistically. It looks awful. ‘Kiss Of The Serpent’ from Ghostly Haunts # 45 (1975) comes next, then a couple of stories where the writer gets a credit at last: ‘Satan’s Night Out’ from Ghostly Tales # 120 (1976) with script by Joe Gill and ‘The Deepest Cut Of All’ from Ghostly Haunts # 46 (1975) by Pellowski, whoever he is. It’s a different take on Jack the Ripper. I should point out that Ditko doesn’t get a credit on any of these stories neither but we know it’s him because of the book title. Moreover, he has one of the most distinctive styles in the industry. The list goes on but there may be a fan out there who has been scouring the comic shops for one of these lost classics. ‘Werewoods’ from Ghost Manor # 31 (1976) in which a wood comes to life. ‘Doorway Into Tomorrow’ from Strange Suspense Stories #39 (1958). Oddly spare artwork on this but again apt for the story. ‘The Faceless Ones’ from This Magazine Is Haunted #12 (1957). More invaders from another dimension. They’re everywhere! And so it ends. All this is interspersed with some moderately entertaining essays, splash pages from other stories, some original art and rare photos of Ditko. In one essay, ‘Friend Ditko’, Mykal Banta informs us that Ditko seemed very happy at Charlton Comics in the 1970s. Hmmm, he may have been happy but he wasn’t doing his best work and if the stuff herein was put in chronological order that would be even more glaringly obvious. His 1950s work for Charlton was better. It’s amazing how good it is really. Charlton was a good way to break into the industry for many but the appallingly low pay rates inevitably meant that work had to be rushed. An artist had to make enough to live on, after all. It’s a big, fine hardcover book with excellent production values. Is the material worth this lavish attention? You decide, Ditko fans. I found the 1950s stuff interesting but by the 1970s I think he was coasting. I’m glad he was happy but it’s not his best work. I think we all know what was his best work. Alice In Comicland by Craig Yoe (book review). « Steve Coogan gets naughty (and bell-bottoms)!